A solid tumor’s growth and it’s progression to malignancy depend on a complex interaction between tumor cells and the body’s blood vessels. As such, vessels are routinely targeted in cancer therapies through anti-angiogenic or anti-vascular approaches. But blood vessels also provide the route for delivering most therapeutics to the tumor, or oxygen to effectuate therapy. 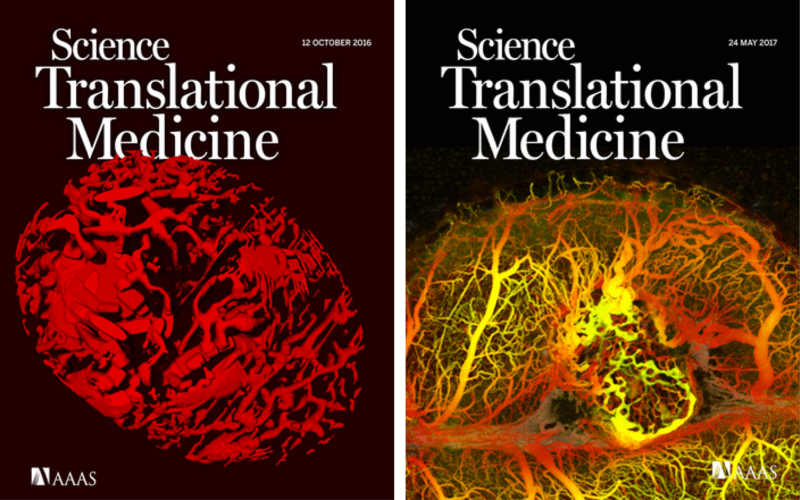 This duality in the tumor microvasculature’s role in cancer therapy underscores the need for intravital imaging of this complex vascular biology. Fluorescence microscopy has been used with great impact as an in vivo platform to study angiogenesis and drug delivery, and to evaluate response to experimental therapies. In this P41, we have worked to develop OCT as a powerful tool with capabilities that are unique and complimentary to those of fluorescence microscopy. OCT detects blood vessels through flow-based endogenous contrast and, as a result, it does not require exogenous tracers, the extravasation and accumulation of which limit the frequency of repeated imaging. OCT can also acquire signals from deeper within tissue than single and two-photon fluorescence microscopies; imaging beyond 1.5 mm is common in OCT. With our collaborators Dr. Jain and Dr. Fukumura and their teams, we have developed methods for preclinical angiography in mouse models of cancer, and we have made these technologies available in a broad set of cancer investigations and therapeutic studies. Vakoc, B. J., Lanning, R. M., Tyrrell, J. A., Padera, T. P., Bartlett, L. A., Stylianopoulos, T., Munn, L. L., Tearney, G. J., Fukumura, D., Jain, R. K. & Bouma, B. E. Three-dimensional microscopy of the tumor microenvironment in vivo using optical frequency domain imaging. Nat. Med. 15, 1219–U151 (2009). Nam, A. S., Chico-Calero, I. & Vakoc, B. J. Complex differential variance algorithm for optical coherence tomography angiography. Biomed. Opt. Express 5, 3822 (2014).